Every week you will work through an online course on basic computer skills at your own pace, with our Technology Education Coordinator available when you need help. You can bring your own laptop or borrow one of the library’s laptops. This program has been made possible by the District of Sechelt’s Community Investment Program. Tuesdays: Feb 5th, 12th, 19th, 26th; March 5th, 12th from 11am-12:30pm in the Teen Area at the Sechelt Library. All programs are free. 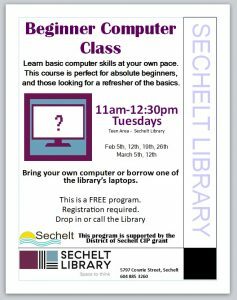 Please call the library (604-885-3260), visit the library, or email info@sechelt.bclibrary.ca to register.